This fall, rare book specialist and technical services librarian Patrick Cates and your reference librarian Mary Robison put their heads together and decided to show off some of the other rare materials we have that relate to Hebrew and the Old Testament. Just after the beginning of the Michaelmas term, the longstanding tradition in the Library is to host Professor Owens’ Old Testament I class and show off our Torah Scroll. Former students tell us that this was one of their favorite classes – folks are always excited to see the Torah unrolled and open for view and touching. (We should note that this particular Torah Scroll is from the nineteenth century and was deconsecrated long before it was given to the Keller Library.) The Torah came out to great fanfare on Monday, September 10, and stayed out in the Reading Room all day for people to see. …but the real eye candy this fall is found in the display cases, which now house Hebrew prayer books, amulets, scrolls (both Hebrew and Samaritan) and a lovely nineteenth-century Ketubah, made of hand-painted paper attached to linen. In the old St. Mark’s Library, these materials were kept in the safe, and almost nobody got to see them – so we’re particularly excited to show them off now. While we don’t have extensive details about the provenance of these generous and unique gifts, we do know that they are part of a collection of materials given to the General Theological Seminary in 1950 by The Rev. Dr. H. Henry Spoer (1873-1951). Dr. Spoer served on the staff of Trinity Church Wall Street and St. Paul’s Chapel from 1938 until he retired in 1950. Born in Krefeld, Germany, Dr. Spoer received degrees from New York University (M.A. 1898, Ph.D., 1899); Rutgers (B.D. 1898), Lichfield Theological College (1909-1910) and was ordained priest by the Bishop of Lichfield in 1911. Dr. Spoer served as assistant chaplain of All Saints Church in Cairo, Egypt from 1912 to 1913 and was imprisoned by the Bolsheviks at Baku. His obituary in the New York Times notes that he was “sentenced to be executed, and had taken his place before the firing squad” when he was granted a reprieve. He then served as High Commissioner for Relief in Baku. Dr. Spoer served in various positions in the Diocese of Michigan, in academic positions in the Midwest and as chaplain to the New York Mission Society for eleven years before joining the staff of Trinity Wall Street. Dr. Spoer wrote several publications about Eastern Christianity, including An Aid for Churchmen Episcopal and Orthodox (1930). 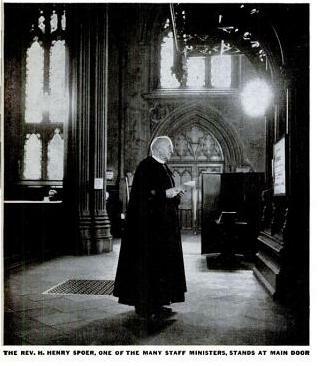 The photograph that accompanies this post is from a Life magazine pictorial essay dated November 15, 1943 about the Trinity parish. We’re thankful for the life and ministry of Dr. Spoer, whose treasures we hold dear, and this post is a small way to express our gratitude for his generosity to the Christoph Keller, Jr. Library at The General Theological Seminary. It’s absolutely unnecessary to be taken prisoner or stand up to the Bolsheviks in order to be a Friend of the Library or to support us with your generosity! If you would like to support the Keller Library’s Special Collections, either through a gift of materials or financial support, please contact The Rev. Andrew Kadel, Library Director. …and come on over and have a peek at these marvelous items on display this fall! I am delighted to know that some of this collection is on display. There is something powerful in making these connections with our forbearers. A profound sense of wonder and awe at God’s hand at work throughout time.